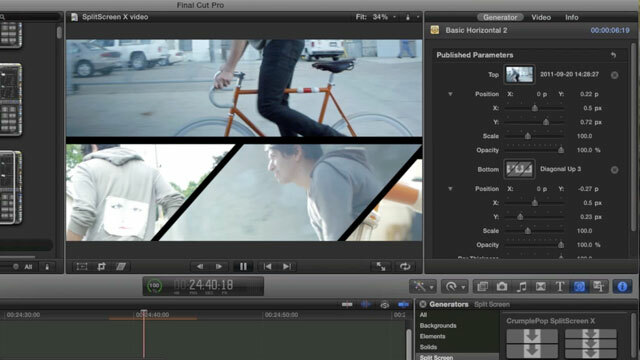 You are probably already familiar with Crumplepop's range of effects and template for FCP7 and FCPX. They have just announced their latest product, SplitScreen X which give an editor 38 different split screen shapes to choose from. "Accompanying the classic rectangular split screens are new angular screens â€“ triangles, angled stripes, and the Dallas style split. With SplitScreen X you can customize your split screens in several different ways: By using sliders to position a screen along the X or Y axis, by entering precise numerical values to match screen elements exactly, or by using onscreen controls to quickly and easily recenter or scale your screens. By including this range of controls, SplitScreen X makes is easy to quickly create a very wide variety of looks. SplitScreen X allows you to scale any clip within any screen. Just grab the corner of the onscreen control and drag to adjust the size. For more precise adjustments, you can use the Scale slider or enter precise numerical values. And as with every control in SplitScreen X, you can add keyframes if you would like the scale to change over time within your split screen. Once you have created a split screen, you can insert it into any other split screen. This allows you to quickly create an enormous variety of nested split screen configurations very easily. No matter how complex the design, you can likely achieve it by nesting split screens in SplitScreen X. Any split screen can be rotated to create a completely unique design. While the screens rotate, the video clips retain their normal orientation, allowing you to flip or transform any split screen. Combined with scaling, this technique can be used to create some extremely unique split screen designs."